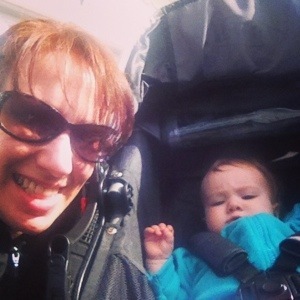 I get a lot of questions about this, so I’m going to get out my feelings about why T25 is great as a postpartum workout. I think that a lot of this is also true for anyone, and that I’ve said some of it before. But here it will be, all in one place! First and foremost, TIME! What do you have little of when you’ve just had a child? Would you rather be using the little time to sleep than to go to the gym, workout for an hour, drive home? I don’t have time to get to/from the gym and workout, so working out at home has worked really well. Plus this is just about 28 min with the cool down. Yay! Second, and extremely important as well, effectiveness! You’ll feel like you’ve had a longer workout with these. There are no stops/breaks built in to these workouts. It’s very much adaptable for different levels. Tania shows modifications and you can easily switch between following her and following others. 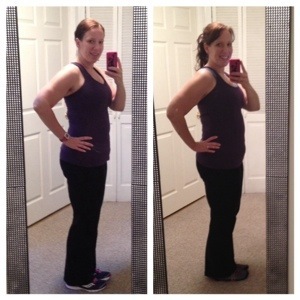 This is so important post baby since you will be getting back into things with a new body. I didn’t start out with T25 (I did Turbo Fire first) but with both, the things I could handle doing, especially with jumping and abs, changed pretty fast. I think it was a testament to the workouts as well how much I improved in ability! The food plan that comes with it (and the recipes) are super simple. And a lot of them were foods my daughter would eat as well (I did T25 starting when she was about 8 months), so that was helpful! I did T25 right after Insanity. I had a terrible time keeping my milk supply up during that but not during T25. If there is something you are looking for answers about, comment! I’m happy to answer any questions. 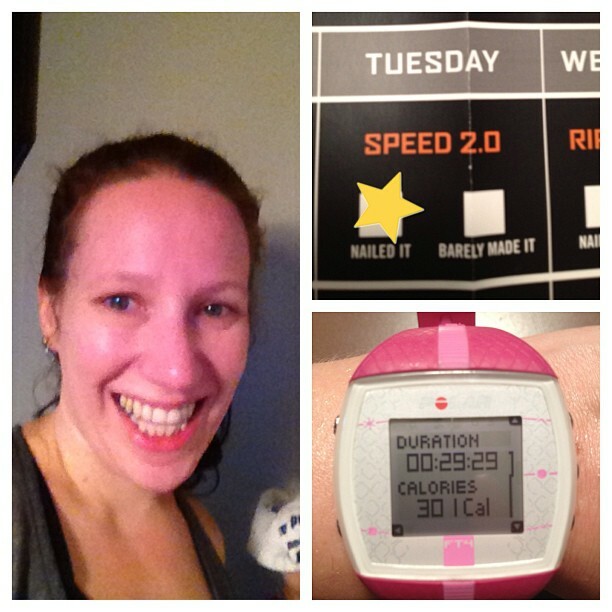 The last of the T25 Beta phase workouts! Dynamic Core is an ab workout with a slight cardio component. The first half is standing. I love standing ab work! I feel like it really helps to teach you how you can work the abs better (and support your body better!) in daily life. Then we move to the floor. 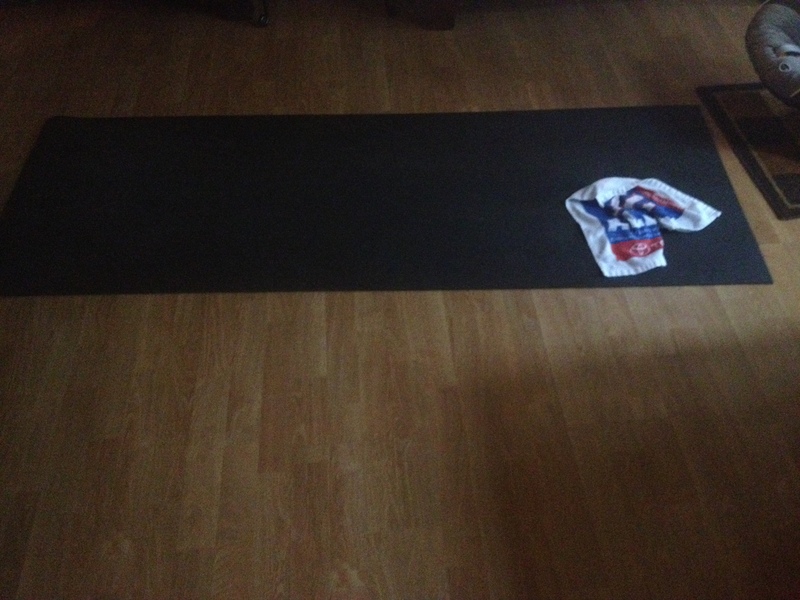 Most of it is difficult but doable…then you get to bicycles and v holds. Oof! It is the only time I remember seeing the people in the video struggling! It is tough. But then it ends. And you can modify or take a moment if needed, but if you pause always come back to try again! The last move is a plank walk to squat pyramid (so plank walk, squat, plank walk, up to squat, to plank, to squat…increasing squats for each plank walk) and is a great end to the workout. You’ll be counting down the seconds! This uses a mat. There is a little part that I have trouble with while down on the mat…there’s a sequence of side planks with other moves in as well. You do a side plank, switch to something else, then go back to a side plank with toe taps forward and back, then more moves, THEN switch to the other side. I’m always setting myself up wrong. Not sure if that will help anyone! What’s your favorite core workout? Our next T25 workout is Rip’t Circuit. This one seems easier to me than Total Body Circuit from the alpha round, probably because of the weights. I find that body weight exercises are more difficult for me than using weights. You can’t adjust body weight! The workout goes cardio, upper, lower, abs…repeat for 25 minutes. You get an all over workout nice and quick. It is quick paced, so be ready to move through the movements and not really take time switching…remember we are go go going in Focus T25. Some non-cardio moves also raise the heart rate. So you do get a good calorie burn, though it is lower than the cardio specific workouts. There are a good amount of push ups, so I guess be warned! I like this workout, but don’t have much to say about it. If you have questions, ask away! Going on to the next T25 workout, we have Speed 2.0. This is not your alpha round Speed program! Speed 1.0 alternated cardio and stretching. Speed 2.0 is all cardio for the 25 minutes. So let’s talk about the format. We start out with round 1, level 1 – cardio drills, all in a row with no rest. Then, we repeat for level 2 and 3 of round 1 with the time of each drill getting shorter. Then it’s round 2, same thing. Then with under 8 minutes left, there’s a jog recovery period. Yup…you are going going going the whole time until then. No time to even think about it…the time flies! Next, we take it from the top…round 1 and round 2 done two times in a row. Followed by another jog recovery. Then you think I surely couldn’t do another round with the time we have left. You’re wrong! One more time on super speed, with the drills only lasting a few moments. 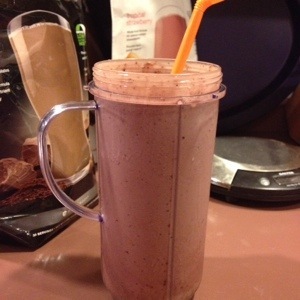 Ending on a jog recovery. I’m not going to lie…I like it. You may think I’m crazy, but it is a great workout and goes by in a flash. This is one of those workouts that I will do for years to come. I think it would be great for a holiday where you’re pressed for time but need that calorie burn. 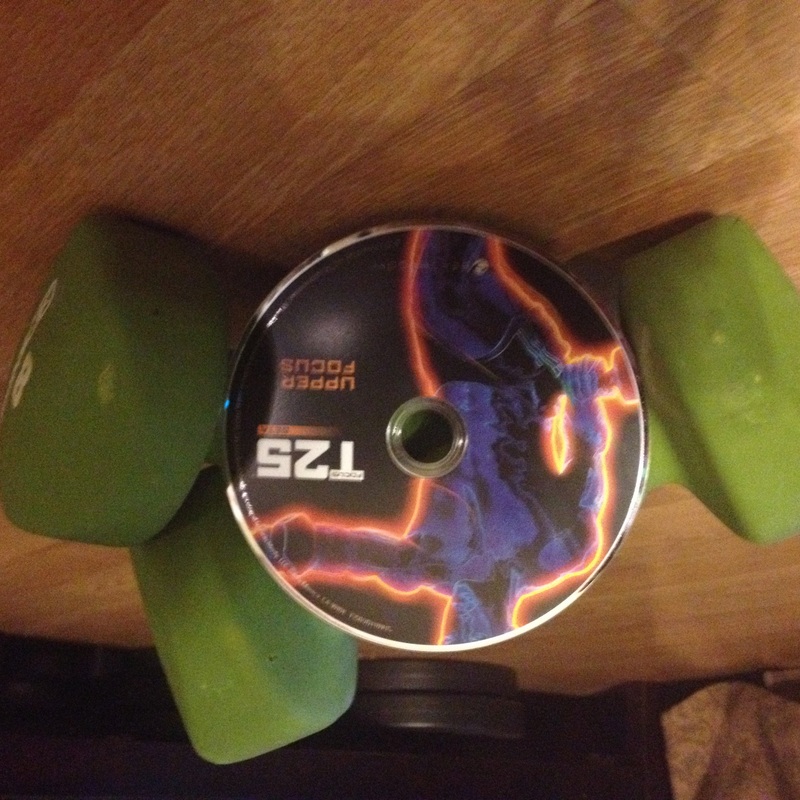 We move on to T25 Upper Focus in our T25 Beta phase workout. This requires weights or bands and a mat. 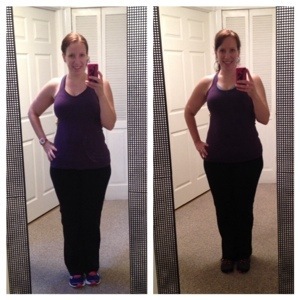 A resistance band is included with the workout program, and works well. I prefer to use weights because it’s easier set up (just pick them up!) but bands are easier to adjust the resistance. There is one person using bands in the video, so he will show you how to set it up. One thing about using weights with this video – they use one set of weights each and there isn’t time built in to switch between exercises. I end up using 8 lb weights though I could probably go higher on most exercises. I’m going to put out 10s next time and try to switch for the front raises and any other exercises if needed. The workout alternates segments of upper body exercises with cardio recovery. I usually am pretty happy to get to the recovery! There are all sorts of upper body exercises. Most people will find that the body weight exercises are the hardest – push ups, tricep dips, hip ups – are the most difficult, especially when they’re at the end of a tough workout! But it is doable…nothing too crazy. And no burnout round! I really like this workout and was excited to be using weights again after Insanity and T25 Alpha phase. Rip’t Circuit uses them as well, but that will be later this week.